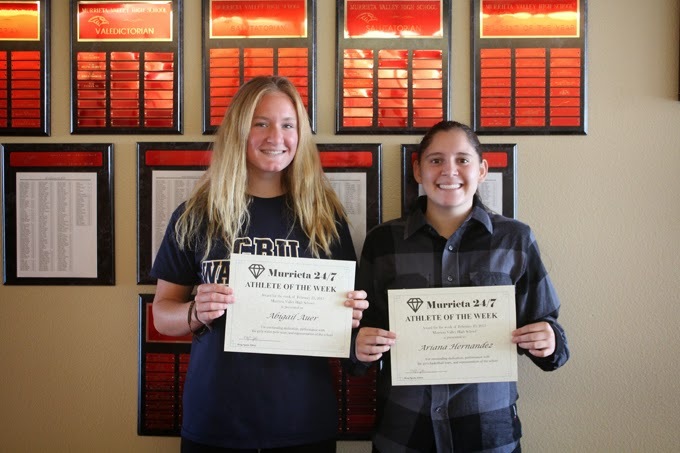 Abigail Auer (left) and Ariana Hernandez are the Murrieta Valley High School Athletes of the Week. Abigail Auer is a senior co-captain for the girls water polo team, which has advanced to the CIF Division 2 playoffs. The Nighthawks will play El Toro Wednesday night in Irvine. Guard Ariana Hernandez had her second highest point total with 15 while adding 6 steals, 4 assists and 2 blocks in the girls basketball team's win over El Toro last week in the CIF Division 1A playoffs. These athletes are also eligible for consideration as Athlete of the Month, which will be announced the first week of March.